The EcoVadis CSR assessment methodology is at the heart of our Ratings and Scorecards. Diversification of sources to ensure rich enough stakeholder input for reliable scoring. Technology is a must applied to ensure the process is secure, confidential, and to accelerate the cycle time. Company answers the customized questionnaire and provides supporting documentation on the EcoVadis platform. Analyst team conducts a document analysis, reading and extracting data from supporting documentation available. The EcoVadis 360° Watch selects stakeholder information from legitimate and transparent sources verified by EcoVadis. A score from 0 to 100 is allocated to each theme and feedback on strengths and improvement areas are highlighted. Senior analysts verify that methodology guidelines have been followed. 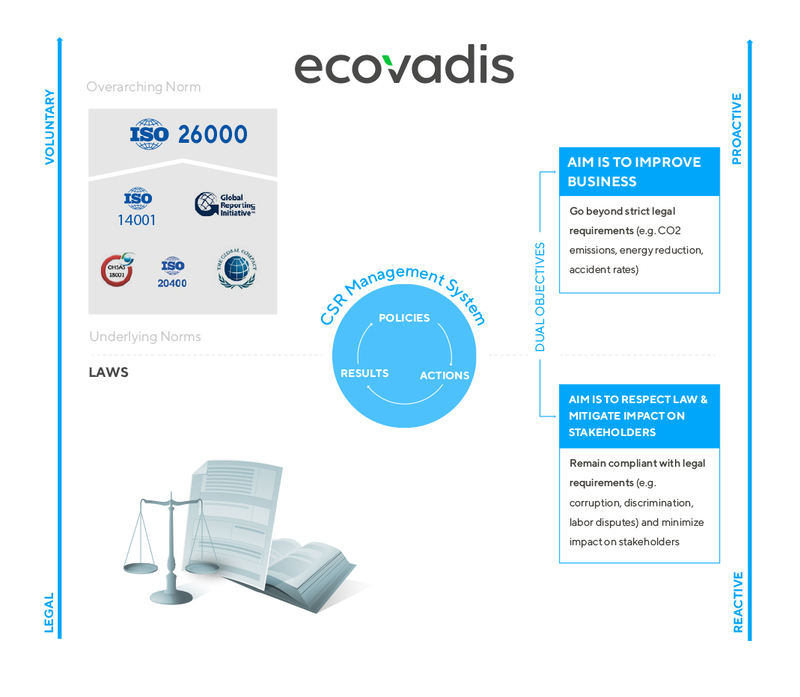 Then the Scorecard is published on the EcoVadis platform. 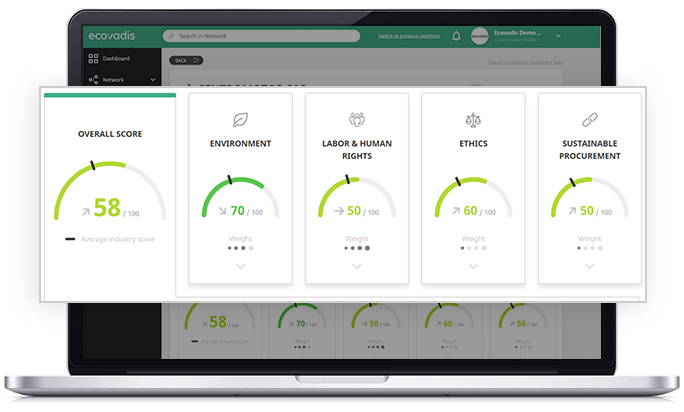 The assessment considers a range of CSR issues, which are grouped into 4 themes: Environment (ENV), Labor Practices & Human Rights (LAB), Fair Business Practices (FBP), and Sustainable Procurement (SUP). The CSR issues are based upon international CSR standards such as the Ten Principles of the UN Global Compact, the International Labour Organization (ILO) conventions, the Global Reporting Initiative (GRI)’s standards, the ISO 26000 standard, the CERES Roadmap, and the UN Guiding Principles on Business and Human Rights, also known as the Ruggie Framework. The issues covered in each assessment are based on the relevance of the 21 CSR issues to the company context, such as industry, size, and geography. These are defined upfront during supplier registration on the EcoVadis platform and will shape the questionnaire received. EcoVadis continuously follows the ever-growing and evolving landscape of CSR-related initiatives and standards. Hundreds of such external CSR initiatives as well as management system certifications can be taken into account in the EcoVadis assessment when they demonstrate a company’s commitments that support their CSR strategy or provide an additional reassurance of a company’s CSR performance. By adapting the rating methodology based on activity, size, and geography of the assessed company, this produces standardized scores that allow for benchmarks: CSR performance of evaluated companies can therefore be easily compared across different countries, company sizes and purchasing categories. To remain compliant with legal requirements and minimize impact on company’s stakeholders. For instance, companies will implement an anti-corruption management system to prevent employees from getting into legal issues. To improve business performance and the bottom line. For instance, companies will set objectives in order to reduce energy consumption and ultimately reduce cost. Another example would be the implementation of training programs to develop human capital, increasing efficiency and productivity. EcoVadis Methodology seeks to serve both goals, with an emphasis on expanding the opportunity for value creation through improving CSR practices.